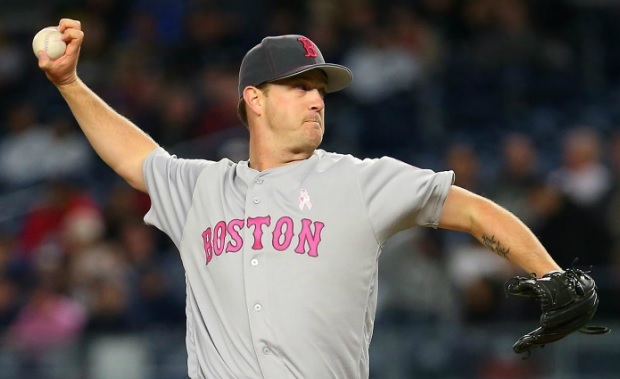 Three Boston home runs and a complete game from Steven Wright (pictured) proved to be the winning formula as the Red Sox beat the Yankees 5-1 on Sunday night in the Bronx. The win allowed the Red Sox to avoid being swept in the three-game series. Dustin Pedroia started the Boston scoring with a two-run home run to right field in the top of the first inning off Yankees starter Luis Severino. David Ortiz slammed the first of his two solo home runs in the top of the fourth and the second in the seventh inning. It was the fifth time Ortiz has hit multiple home runs in Yankee Stadium, and he's now hit 52 against New York. Ortiz is now tied with Ernie Banks and Eddie Matthews for 22nd on the all-time home run list. Xander Bogaerts closed out the Boston scoring with a home run to left in the eighth. Steven Wright recorded his first career complete game with the win. He allowed just one run on three hits and a walk while striking out seven. His ERA dropped to 1.52. Jackie Bradley Jr. had two hits and has now hit safely in 14 straight games.